This article is part of our ongoing series about post-production workflow with Phase One Capture One. As a Sony camera owner you get Capture One Express (for Sony) with your purchase. In this series, we’ll show you how to get more out of the software. Of course, you don’t have to be a Sony shooter to make use of these tips. They’re for anyone who wants to use Capture One. Like most imaging software, Capture One offers a huge variety of keyboard shortcuts to help your workflow. Capture One goes a step further in offering complete customisation of all the shortcuts. There are very good reasons to use shortcuts and reduce your dependency on the mouse and menu systems. Generally, computer professionals acknowledge that using the keyboard instead of a mouse increases your productivity and helps you do more tasks. In other words, your job is done faster and easier when you use shortcuts. Take for example the task of selecting all the images in Capture One’s browser. You can simply do that by pressing Cmd/Ctrl + A, whereas using a mouse requires Shift-clicking on the first and last image. When using the keyboard you don’t have to follow a pointer to see what you’re doing. You can do anything semi-automatically thus freeing your mind for other tasks. To start images processing, for example, it’s a simple Cmd/Ctrl + D, regardless of what’s open or visible in Capture One Pro. You can combine the advantages of using the keyboard with those of using the mouse. For example, drawing a Local Adjustment mask is much easier done with the mouse. However, at the same time, you can switch brush mode with the keyboard. There are many aspects of your workflow that can be achieved more precisely with shortcuts. Hunting for menu items, for example, takes a toll and as you get impatient and fatigued, it becomes increasingly more likely that you'll make a mistake. While most of these errors can be quickly undone, they slow you down and add frustration to a process that doesn't have to be frustrating. Capture One has different cursor keys that change the way the cursor works. This can be manually selected from the Cursor toolbar at the top of the screen. The most common ones to use are the Select, Pan and Crop cursor tools and their shortucts are as follows. It’s simply much easier and faster using those shortcuts than mousing up to the toolbar. Capture One’s workspace is divided into the Tools, Viewer and Browser and there are shortcuts to hide and show each of those. For the Viewer the default shortcut is a combination of 3 keys (CMD/CTRL+ALT+V) but as Capture One’s shortcuts are customisable we can simplify that further. 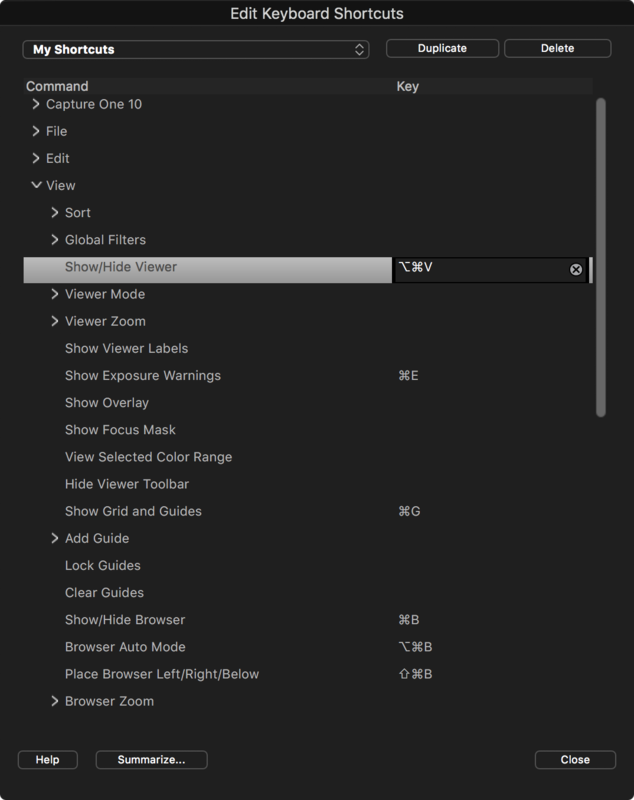 Browse down and highlight Show/Hide Viewer and change that to the shortcut of your choice. Click on the ‘x’ to clear the current shortcut. For a good single key option, use the key just below the ESCAPE key. It will most likely be a ‘period’ or ‘tilde’ symbol. This is a good ergonomic choice if you are right handed. Your right hand can sit on the mouse or pen, and your left hand can easily reach “C”, “V” and “H” as well as your new shortcut for hiding the Viewer. If you're left handed, choose something less commonly used on the right-hand side of the keyboard. “U” for example is not used for anything by default. Another shortcut you might like to modify from the default is “Full Screen”. Modify it in the same way as above. “F” is naturally a good choice! 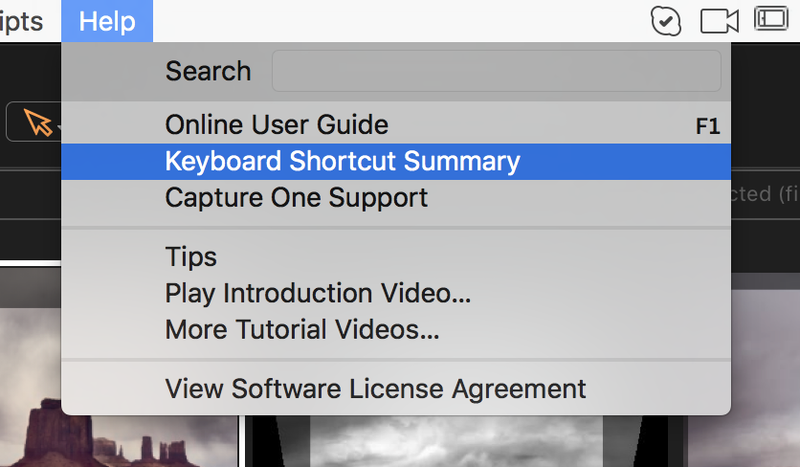 Simply using these 6 shortcuts will save you a good chunk of time in using Capture One. From there on, try to expand your knowledge of other shortcuts and speed up your workflow even more.